The Hup Solar-One battery is optimized for solar power systems. It has a slightly enlarged steel case that allows the individual plastic 2 volt cells to be removed, making the battery easier to move without a forklift or crane. Batteries are designed to deliver 2100 cycles to an 80% depth of discharge. They will deliver 4,000 cycles to 50% depth of discharge and 6,000 cycles to 20% depth of discharge. Their 10 year warranty covers full credit for defects in materials or workmanship In the first 5 years and prorated credit over the second five year period. Price includes freight to a business with forklift or trucking terminal, In the lower 48 states. 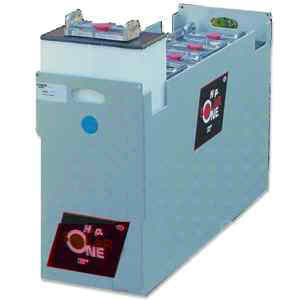 Each Solar-One 12 volt battery is made up of six 2-volt cells. Order two for 24 volt sys- tems and four for 48 volt systems. The -13, -21 and - 25 batteries are usually available from stock. Other sizes are made to order; please allow up to 6 weeks for delivery. S0-6-85-17 845 A-H 742 40” x 7.15” x 25"